That is it in a nutshell as the panel discussion provides evidence of. Russia and Vladimir Putin has clearly shown publicly how weak and ineffective the Obama administration truly is. While Obama’s vision of Utopia is to downsize the US military, other countries are expanding theirs. Obama’s threats of sanctions and chest puffing is having no effect on Russia who understands there is nothing Obama can doabout Russia taking back the Crimea region of the Ukraine. What Obama has done is weaken the US to the point where CHina, Russia and others have absolutely no respect for him, the power of the US and laugh off Obama’s “red lines” as the continue to cross them even as he or his administration is issuing them. Obamas fantasy land has just become America’s nightmare and his head is so far up…….in the clouds, he doesn’t even understand the damage he caused OR like many believe, he has deliberately worked to bring America down from within. 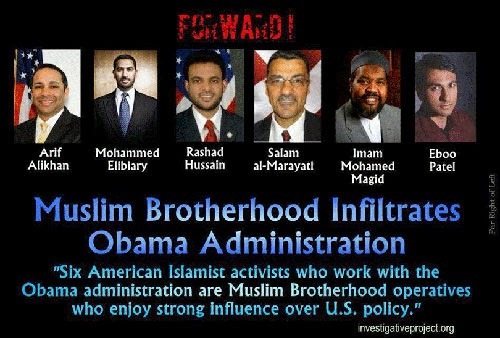 Let’s go back to Obama’s support of the Muslim Brotherhood for a second….. their stated goal is to bring America down from within.